Update 4: And now time for another twist: in a brief, two-minute address, Theresa May said that the Cabinet has backed the draft deal which was the "best that could be negotiated." She also said that the choice was "her deal, no deal or no Brexit at all" and it represented the "collective decision of Cabinet" to push ahead with the deal, even though the decision was not taken lightly. The prime minister said that the deal is the result of "thousands of hours of meetings" and that she "firmly believe that the draft withdrawal agreement was the best that could be negotiated." Despite her apparent optimism, she warned that "there will be difficult days ahead. This is a decision which will come under intense scrutiny." May effectively is presenting the choice as between her deal, or no deal "or no Brexit at all." This, as Bloomberg notes, is aimed at Brexiteers in her party who aren't happy with the deal and the U.K. keeping closer ties to the bloc than they want. She also confirmed she'll make a statement in Parliament tomorrow. She concluded her brief statement by saying that the decision is "in the best interests of our United Kingdom." And now, bring on even more flashing red headlines, denials, media clarifications and fake news. What is odd is that the pound, which was expected to pop higher if cabinet backing is secured, has failed to rebound on the news and is in fact, unchanged on the day. Perhaps this is due to May's reference to difficult days ahead which was enough to leave bulls cautious of going all-in. Update III: The chaos continues. One source says there aren't enough letters yet to spark a leadership challenge...but that doesn't necessarily mean one won't happen. While frustration remains high, there hasn't been an official ERG decision to submit the letters of no confidence. Meanwhile, after entering its fifth hour, May's contentious cabinet meeting is reportedly on the verge of wrapping up. According to the Guardian, the fact that it ran three hours over suggests that ministers have "substantial concerns" about the deal. Update II: As frustration with Theresa May's still-unpublished draft Brexit deal intensified, Brexiteer MPs (most of whom are members of the European Research Group faction led by Jacob Reese-Mogg) are sending in letters calling for a 'no confidence' vote, which BBC political editor Laura Kuenssberg said could happen as soon as Thursday morning. Meanwhile, the Europeans are turning up the pressure, threatening to cancel the hoped for Nov. 25 summit if May can't find support for the deal Wednesday night. Unsurprisingly, cable is back at lows. 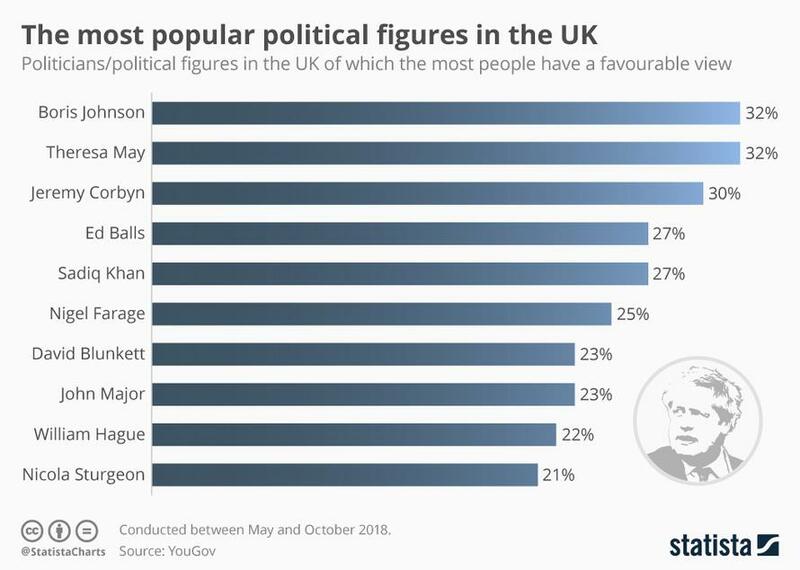 Since the subject of leadership change is back in the headlines, here's a roundup of the most popular political figures in the UK (courtesy of Statista). Notably, Boris Johnson is the most popular Brexiteer, making him perhaps the most likely candidate to succeed May. Update: 10 Downing Street is now saying there will be a short statement Wednesday night following what has become a marathon meeting with May's cabinet. Though the full press conference has been canceled. The pound is beginning to erase some of its losses triggered by news of the cancellation. As MPs from the ERG faction (the group of Brexiteers led by Jacob Reese Mogg who have persistently opposed the deal) say May's deal in its current form doesn't have the votes to pass, Downing has pushed back May's planned statement until tomorrow. Meanwhile, here's a glimpse at chaos as journalists struggle to figure out what the hell is going on. 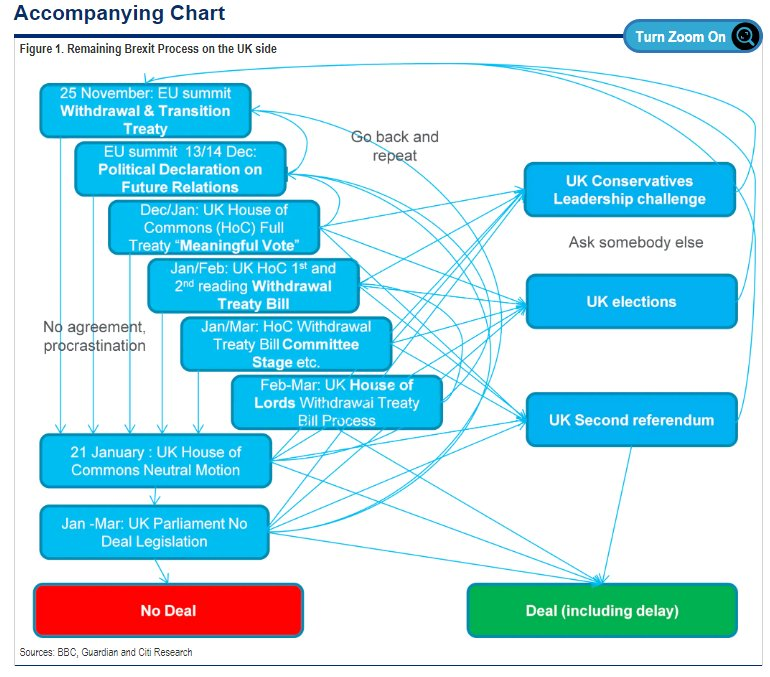 And, as this flow chart of the most likely scenarios shows, things are only going to get more complicated from here. Across the channel, the group of 27 EU ambassadors has ended their discussion of the draft plan - and reportedly they have been given no indication about the prospect for a deal. Since that meeting has been let out, expect any further leaks about the deal to come from the EU side as hope that May might have given Barnier enough hope to call a broader summit begins to fade. ...The BBC has confirmed that Theresa May's Wednesday night press briefing - which was preemptively scheduled so that she could announce that she had secured cabinet support for her latest draft Brexit deal - has been cancelled. News of the cancellation followed reports from earlier in the afternoon that May's address, which had initially been planned for 5 pm London Time, would be pushed back by at least two hours as more than a dozen cabinet members had yet to speak. "I am authorised to inform the House there will be no press statement this evening. There was considerable concern in the House about that happening before the PM came to parliament." The pound weakened against the dollar and euro on the news.